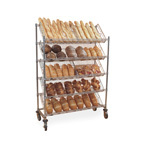 Metro Slanted Display Shelves for high visibility and quick, easy accessibility to merchandise. Additionally, retail uses include displaying your product. Slanted shelves adjust at 1″ increments. Furthermore, slanted shelving permits high visibility of merchandise and gravity feed of small items. Finally, Metro Slanted Display Shelves can be combined with standard Super Erecta Shelving and posts or qwikSLOT posts. Shelves are 18″ (455mm) wide. Facings are highly visible and accessible. Restocking is quick and easy. Approximate 45° shelf slope allows gravity feed. Looks full, even when “shopped” down. Shelves adjust at 1″ (25mm) increments. Divider keeps different types of merchandise separated and in order. Metro Slanted Display Shelves for high visibility and quick, easy accessibility to merchandise. Additionally, retail uses include displaying your product. Slanted shelves adjust at 1" increments. Furthermore, slanted shelving permits high visibility of merchandise and gravity feed of small items. Finally, Metro Slanted Display Shelves can be combined with standard Super Erecta Shelving and posts or qwikSLOT posts. Shelves are 18" (455mm) wide. Shelves adjust at 1" (25mm) increments.